As one of the biggest and most ambitious updates since its inception, Warframe’s Plains of Eidolon update introduced an open-world area in a free-to-play game that’s otherwise entirely populated by procedurally generated levels. In this guide, you’ll find information on what was included, such as bounties, fishing, mining, and even hunting things called Eidolons. It may have been a while since you last touched Warframe, perhaps eagerly anticipating this update before diving back in. There’s certainly a lot of complexity in this game and this update only complicates things further, so be sure to glance through our Warframe guide to get up to speed before leaping into the new stuff. The Plains of Eidolon update for Warframe introduces two new types of resources: Fishing and Mining resources. Each are obtained by, you guessed it, fishing or mining and are used to build items that were introduced in the same update as the Plains. So, there’s a lot of stuff to do in the Plains. In typical Warframe fashion, it’s not terrifically well explained, so let’s dig in. Most of your time in the Plains, at least early on, will be spent doing Bounties. To kick them off, head to Cetus on Earth, find the NPC Konzu (he’ll be the one by the door to the Plains that most people crowd around), and pick a Bounty. Then head over to the big ol’ doors to head into the world. There, you’ll see an objective marker. Head over there, finish the objective, then head to the next one. After a series of short missions, you’ll have completed the bounty, earning yourself a reward (certain Warframe mods and the Gaara Warframe can only be found this way), as well as some Standing points. Those Standing points are necessary for doing just about everything else the Plains of Eidolon have to offer, so make sure you do a few of them first. To get started with mining, head over to Old Man Sumbaat in Cetus and grab yourself a Nosam Cutter. That will be your tool for the next farming session, so make sure to equip it to your Gear on the Arsenal screen. Just like the Spears, there are three different Cutters. This time around though, the more expensive cutters are clear-cut better than the inexpensive ones. They increase the detection distance, as well as allow you to cut out more and different types of minerals, which is worth looking into. Head out into the Plains, and whip out that Cutter. Once that’s out, the HUD will tell you a few bits of information. It’ll tell you how many mining nodes are nearby, as well as how far you are from the nearest node. With that information, you should be able to sniff out the closest nodes. Be careful, though. You can’t have a gun and a Cutter out at the same time. Once you’ve found it, it’s time to dig it out. Aim your Cutter at the rock and start digging. Try to follow the line pattern around the symbol (not the symbol itself, like I mistakenly did for a long time). The closer you get, the more minerals you’ll get out of the vein. While mineral veins can be found out in the open areas of the Plains, it’s best to look through the various caves strewn around. The vein density is much higher, but you’ve got to keep your eye out more, largely due to your being temporarily unarmed in a enemy-dense area, but also because veins can appear on ceilings and walls that you wouldn’t expect to have to look up. Fishing is a little more complex than mining. 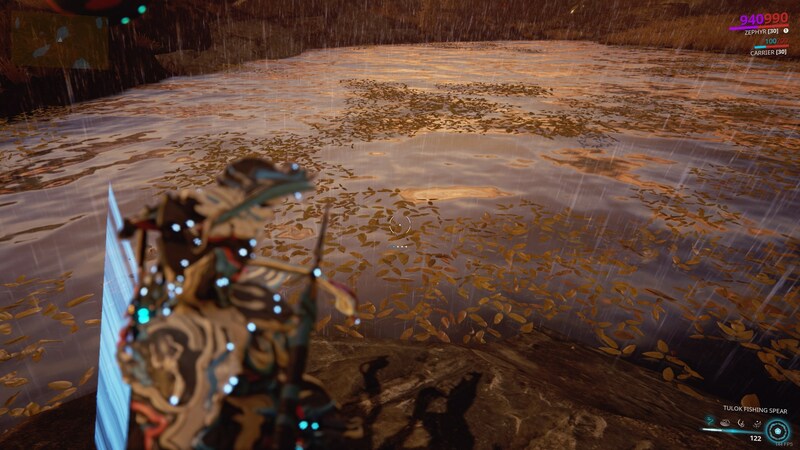 Once you have enough Standing, you can head over to the fisherman Hai-Luk in Cetus and pick yourself up a Fishing Spear. Make sure to equip it in one of your Gear slots, then head out to the Plains. You might notice that there are different types of Spears in Hai-Luk’s shop. Each of them has their own unique advantages against certain types of fish, so make sure you know what you’re hunting with. Or, just use the basic one and have to make a few extra throws to kill those particularly scaley fish. It’s fine either way. Once out in the Plains, find a body of water. The types of fish that appear depend on the type of body of water that you’re looking around in, so if you’re looking for Mawfish, head over to the large lake directly north of the Plains’ entrance. If you’re looking for Goopolla, the coastline is the place to check out. The full list of fish locations is over at the Warframe Wiki. As soon as you spot a fish in the water (which can be easily done by using your Codex Scanner to highlight them), pull out your Fishing Spear and chuck it at them. Assuming you land it, you’ll get a fish that you can take back to Hai-Luk to cut up for resources. If you’re struggling to find a specific fish, consider grabbing some bait from Hai-Luk. Don’t just throw it into the water willy-nilly though. Instead, find a spot where bubbles are floating to the surface of the water and toss it in. That will increase the likelihood of certain fish spawns in that location for the next three minutes, so spear away. 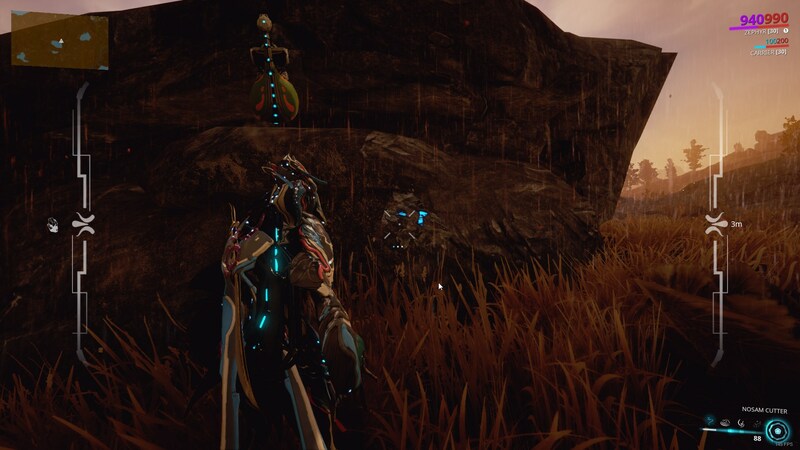 The Plains of Eidolon also feature some of the toughest enemies that Warframe has to offer: the three massive Eidolons. Killing them provides unique rewards, but they are supremely difficult to bring down. The first type, Eidolon Teralyst, comes out only at night, walking up from big bodies of water, that are indicated by pillars of blue light. The other two however have to be summoned. Teralysts drop Brilliant Eidolon Shards on death, which can be brought to a shrine on the main island on the lake to summon a Gantulyst. Gantulysts drop Radiant Eidolon Shards, which summon a Hydrolyst. All three drop a unique type of Mod called an Arcane Enhancement, which can be installed in a special slot in addition to all of your other Mods, but doesn’t take up any Capacity. The full list of Arcane Enhancements is right here on the Warframe Wiki. If you want those Arcanes, you’re going to have to bring some of the best gear you have, as well as some backup in the form of teammates. With their massive health pool and multiple phases, they’re probably going to take your group a few tries to bring down, but the rewards are very much worth it. Once you’ve finished with these though, you should have a bunch of Mods that should be able to deal more damage to certain foes. Feel free to jump to our Warframe damage guide to work out how best to use your new-found augmentations. If you’re looking for more information about the newest Warframe area, head to our Warframe Fortuna guide to learn how to access it.